One of the biggest complaints that Holland breeders have about judging revolves around the unique Holland pose. But I have found that many breeders themselves have problems with the pose. Improperly posed Hollands fail to show off their beautiful top lines or the important head mount that Holland breeders work so hard for. 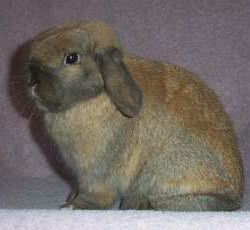 When a breeder cannot pose their Hollands properly, they may fool themselves into thinking that a rabbit has more depth than it does, is shorter than it is, or has a better head mount than it really does. Over-posed Hollands appear to have shoulders that are more narrow than desirable. I recommend a traditional pose [see picture at the left] for evaluating depth. 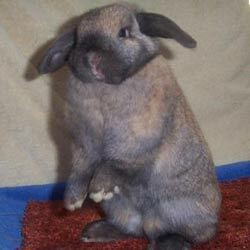 Considering all of the breeds, most rabbits are evaluated in this manner. You can check depth at the shoulder and hindquarter this way without deceiving yourself. I also put my hands around the shoulders/chest of my rabbits to evaluate their depth. If it feels like I’m holding a junior hamburger, the rabbit is too shallow at the shoulder/chest. If it feels like a McDonald’s Quarter Pounder, that’s more acceptable. But what you are looking for is the Big Mac. If, while your rabbit is in a traditional pose, you find that your Holland is parallel to the table from shoulder to hips, then you have a flat rabbit. You might be able to pose him out of it, but he’s still flat. Gently lift the head with your hand under the chin. should do during a show. There are different ways to accomplish this, but I prefer to get the hindquarter set first. Lifting the hindquarter from the table and allowing the rear feet to come down in a natural position is important. You can spread feet out to make the hindquarter look better, or you can accidentally get a foot cocked to the side and make it look worse, so lifting and placing is important. Next, you want to lift the front part of the Holland and place it lightly on its front feet. I do this by placing my fingers on the jawbones. Some judges will place a hand over the eyes. It is probably a good idea to do it both ways so your rabbit is not disturbed on the show table if the judge chooses this method. You want to scoot the front back only until the front feet are directly under the eyes. 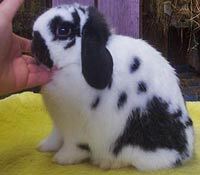 Breeders love to squish their rabbits front backwards too far and declare how short in body they are. Squishing doesn’t make it so. You should not see the rear feet resting just behind the front feet. I know, some Hollands like to do that, but that is not the proper pose. People often ask me how I get my rabbits to pose so well. Some judges have commented after a show that my rabbits were the only ones that would pose for them. They both suppose I work endlessly to get my rabbits to pose well. Actually, the majority of it is genetics. If a rabbit can’t pose well with just a little work, they don’t stay in my program. The only thing I recommend is culling hard and posing your rabbit first thing any time you handle them for any reason. This pose is "too tucked up" to an extreme. The rabbit's front feet are way too far back and the back feet are too far froward. "How DARE you try to pose me!" Judging Lop Rabbit Ears and Crowns.